Written on: Saturday, August 12, 2017. Written on: Friday, August 11, 2017. Written on: Thursday, August 10, 2017. Written on: Sunday, August 06, 2017. Written on: Saturday, August 05, 2017. Written on: Friday, August 04, 2017. Written on: Wednesday, July 26, 2017. Written on: Sunday, July 23, 2017. Written on: Monday, July 10, 2017. Written on: Monday, July 03, 2017. Written on: Sunday, July 02, 2017. Written on: Saturday, July 01, 2017. Written on: Monday, June 26, 2017. Written on: Friday, June 23, 2017. Written on: Wednesday, June 21, 2017. Written on: Sunday, June 18, 2017. Is Your Hand Behind Your Bowling Ball? Written on: Saturday, June 17, 2017. Written on: Thursday, June 15, 2017. Written on: Saturday, June 10, 2017. Written on: Friday, June 09, 2017. Written on: Friday, May 19, 2017. Written on: Thursday, May 18, 2017. Written on: Monday, May 15, 2017. Written on: Saturday, May 13, 2017. Written on: Sunday, May 07, 2017. Written on: Saturday, April 29, 2017. Written on: Friday, April 28, 2017. Written on: Tuesday, April 25, 2017. Written on: Sunday, April 23, 2017. Written on: Wednesday, April 12, 2017. Written on: Monday, April 10, 2017. Written on: Wednesday, April 05, 2017. Written on: Friday, March 17, 2017. Written on: Wednesday, March 15, 2017. Written on: Tuesday, March 14, 2017. Written on: Wednesday, March 08, 2017. Written on: Tuesday, March 07, 2017. Written on: Sunday, March 05, 2017. Written on: Saturday, March 04, 2017. Written on: Thursday, February 16, 2017. Written on: Wednesday, February 15, 2017. Written on: Thursday, February 09, 2017. Written on: Tuesday, February 07, 2017. Written on: Friday, February 03, 2017. Written on: Wednesday, February 01, 2017. Written on: Wednesday, January 25, 2017. Written on: Tuesday, January 24, 2017. Written on: Friday, January 20, 2017. Written on: Tuesday, January 17, 2017. Written on: Tuesday, January 10, 2017. Written on: Monday, January 02, 2017. Written on: Monday, December 26, 2016. Written on: Monday, December 19, 2016. Written on: Monday, December 12, 2016. Written on: Friday, December 09, 2016. Are You Practicing Your Bowling Often Enough? Written on: Friday, December 02, 2016. Written on: Thursday, December 01, 2016. Written on: Monday, November 21, 2016. Written on: Sunday, November 20, 2016. Written on: Saturday, November 19, 2016. Written on: Friday, November 18, 2016. Written on: Friday, November 11, 2016. Written on: Saturday, November 05, 2016. Written on: Friday, November 04, 2016. Written on: Tuesday, November 01, 2016. Written on: Saturday, October 29, 2016. Written on: Monday, October 17, 2016. Written on: Tuesday, October 04, 2016. Written on: Monday, October 03, 2016. Written on: Sunday, October 02, 2016. Written on: Saturday, October 01, 2016. Written on: Thursday, September 29, 2016. Written on: Wednesday, September 28, 2016. How Do I Control My Bowling Ball Loft? Written on: Sunday, September 25, 2016. Written on: Saturday, September 24, 2016. Written on: Tuesday, September 20, 2016. Written on: Monday, September 19, 2016. Written on: Sunday, September 18, 2016. Written on: Thursday, September 15, 2016. Written on: Monday, September 12, 2016. Written on: Friday, September 09, 2016. Written on: Tuesday, September 06, 2016. Written on: Thursday, September 01, 2016. Written on: Tuesday, August 30, 2016. Written on: Monday, August 29, 2016. Written on: Sunday, August 28, 2016. Written on: Sunday, August 21, 2016. Written on: Wednesday, August 17, 2016. Written on: Monday, August 15, 2016. Written on: Friday, August 12, 2016. Written on: Tuesday, August 09, 2016. What Was Your Best Bowling Performance And Why? Written on: Thursday, August 04, 2016. Written on: Wednesday, August 03, 2016. Written on: Tuesday, August 02, 2016. Written on: Saturday, July 30, 2016. Written on: Friday, July 29, 2016. Written on: Thursday, July 28, 2016. Written on: Monday, July 25, 2016. How Is Your Bowling Blood Pressure? Written on: Sunday, July 24, 2016. Written on: Thursday, July 21, 2016. Written on: Tuesday, July 19, 2016. Written on: Sunday, July 17, 2016. Written on: Saturday, July 16, 2016. Written on: Friday, July 15, 2016. Written on: Thursday, July 14, 2016. Written on: Tuesday, July 12, 2016. Written on: Saturday, July 09, 2016. Written on: Thursday, July 07, 2016. Written on: Wednesday, June 29, 2016. Written on: Tuesday, June 28, 2016. Written on: Wednesday, June 22, 2016. What Was Your Best Bowling Performance Ever? Written on: Friday, June 17, 2016. Written on: Tuesday, June 14, 2016. Written on: Sunday, June 12, 2016. Written on: Friday, June 10, 2016. Written on: Sunday, May 29, 2016. Written on: Sunday, May 22, 2016. Written on: Tuesday, May 17, 2016. Written on: Sunday, May 15, 2016. Written on: Wednesday, May 11, 2016. Written on: Friday, May 06, 2016. Written on: Monday, May 02, 2016. Written on: Friday, April 22, 2016. Written on: Saturday, April 16, 2016. Written on: Tuesday, April 12, 2016. Written on: Sunday, April 10, 2016. Written on: Thursday, April 07, 2016. Written on: Monday, April 04, 2016. Written on: Sunday, April 03, 2016. Written on: Wednesday, March 23, 2016. Written on: Sunday, March 20, 2016. Written on: Friday, March 11, 2016. Written on: Wednesday, March 09, 2016. Written on: Friday, March 04, 2016. Written on: Wednesday, March 02, 2016. What Is Your Best Bowling Talent? Written on: Sunday, February 14, 2016. Written on: Saturday, February 06, 2016. Written on: Thursday, February 04, 2016. Written on: Wednesday, February 03, 2016. Written on: Tuesday, February 02, 2016. Written on: Sunday, January 24, 2016. Written on: Wednesday, January 13, 2016. Written on: Monday, January 11, 2016. How Do I Control My Bowling Loft And Release? Written on: Thursday, January 07, 2016. Written on: Wednesday, January 06, 2016. Written on: Monday, January 04, 2016. Written on: Sunday, January 03, 2016. Written on: Saturday, January 02, 2016. Written on: Friday, January 01, 2016. Written on: Thursday, December 17, 2015. Written on: Saturday, December 12, 2015. Written on: Friday, December 11, 2015. Written on: Wednesday, December 09, 2015. Written on: Monday, December 07, 2015. How Can Women Bowlers Combat Dry Lane Conditions? Written on: Saturday, December 05, 2015. Written on: Tuesday, November 24, 2015. Written on: Saturday, November 21, 2015. Written on: Friday, November 13, 2015. Written on: Tuesday, November 10, 2015. Written on: Monday, November 09, 2015. How Do I Tune Up For A Team Bowling Tournament? Written on: Sunday, November 08, 2015. How Can I Improve My Bowling Pre-Shot Routine? Written on: Friday, November 06, 2015. How Can I Best Read The Bowling Lanes To Improve My Average? Written on: Thursday, November 05, 2015. Written on: Tuesday, November 03, 2015. How Can I Zero In On My Bowling Target? Written on: Monday, November 02, 2015. Written on: Saturday, October 31, 2015. How Do I Keep My Balance With No Bowling Slide? Written on: Friday, October 30, 2015. What Can Good Women Bowlers Do To Improve Their Delivery? Written on: Saturday, October 24, 2015. Written on: Wednesday, October 21, 2015. How Can I Improve My Composure When Bowling Under Pressure? Written on: Monday, October 19, 2015. Written on: Saturday, October 17, 2015. Written on: Friday, October 16, 2015. Written on: Wednesday, October 14, 2015. Written on: Tuesday, October 13, 2015. Written on: Monday, October 12, 2015. Written on: Friday, October 09, 2015. Written on: Wednesday, October 07, 2015. Is Hitting Your Bowling Spot Enough? Written on: Sunday, October 04, 2015. How Can I Forget Past Mistakes When I Am Bowling In Competition? Written on: Saturday, October 03, 2015. Written on: Friday, October 02, 2015. Written on: Thursday, October 01, 2015. Written on: Monday, September 07, 2015. Written on: Sunday, September 06, 2015. Written on: Saturday, September 05, 2015. How Do I Fix My Bowling Release Before My Next Tournament? Written on: Friday, September 04, 2015. Written on: Wednesday, September 02, 2015. Written on: Saturday, August 22, 2015. Written on: Friday, August 07, 2015. Written on: Thursday, August 06, 2015. 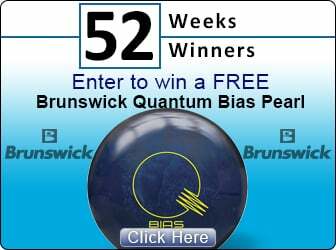 How Can I Get A Consistent Bowling Ball Release Without Losing Too Much Power? Written on: Saturday, August 01, 2015. Written on: Wednesday, July 29, 2015. Written on: Tuesday, July 28, 2015. What Can I Do To Ready My Bowling Swing Before A Tournament? Written on: Monday, July 06, 2015. How Can I Keep From Falling Off My Bowling Shot? Written on: Sunday, July 05, 2015. Written on: Friday, June 19, 2015. How Do I Relax Before Bowling In A Tournament? Written on: Wednesday, June 10, 2015. How Important Is It To Bowl An 800 Series? Written on: Tuesday, June 09, 2015. How Can I Find My Best Form Before Bowling In A Tournament? Written on: Monday, June 08, 2015. How Can I Make My Bowling Release More Consistent? Written on: Wednesday, May 13, 2015. Written on: Friday, April 24, 2015. Written on: Saturday, April 18, 2015. How Can I Regain The Feel With My Bowling Finger Pads? What Can I Do To Improve My Bowling Ball Reaction? Written on: Thursday, April 09, 2015. Written on: Tuesday, April 07, 2015. Why Do I Lose Balance In Bowling Leagues Or Tournaments? Written on: Tuesday, March 10, 2015. Written on: Sunday, March 01, 2015. Written on: Friday, February 27, 2015. Written on: Saturday, February 21, 2015. Written on: Friday, February 20, 2015. Written on: Tuesday, February 17, 2015. Why Do I Get Bad Bowling Pin Carry? Written on: Monday, February 16, 2015. How Do I Shake Off A Lousy Bowling Start? Written on: Sunday, February 08, 2015. How Do I Improve My Bowling Scores Without My "A" Game? Written on: Thursday, February 05, 2015. How Do I Stop Getting Mad In My League? Written on: Thursday, January 29, 2015. How Do I Pick The Right Angle To Play On The Bowling Lanes? Written on: Tuesday, December 23, 2014. Written on: Sunday, December 21, 2014. Written on: Monday, December 08, 2014. Written on: Tuesday, December 02, 2014. Written on: Friday, November 07, 2014. Written on: Saturday, October 25, 2014. Written on: Sunday, October 05, 2014. Written on: Saturday, September 06, 2014. Written on: Friday, August 08, 2014. Written on: Friday, May 09, 2014. Written on: Saturday, May 03, 2014. Written on: Friday, May 02, 2014. Written on: Friday, April 18, 2014. Written on: Monday, March 03, 2014. Written on: Thursday, February 13, 2014. Written on: Sunday, January 12, 2014. Written on: Saturday, January 04, 2014. Written on: Wednesday, December 18, 2013. Written on: Friday, December 13, 2013. Written on: Monday, December 02, 2013. Written on: Sunday, November 10, 2013. Written on: Tuesday, October 29, 2013. Written on: Friday, September 06, 2013. Written on: Tuesday, September 03, 2013. Written on: Monday, August 05, 2013. Are You Trying To Hook Your Bowling Ball Too Much? Written on: Thursday, June 27, 2013. Written on: Tuesday, May 01, 2012. Written on: Tuesday, March 06, 2012. Written on: Monday, March 05, 2012. Written on: Monday, February 06, 2012. Written on: Thursday, February 02, 2012. Written on: Thursday, December 22, 2011. Written on: Sunday, October 02, 2011. Written on: Friday, August 12, 2011. Written on: Saturday, May 28, 2011. Written on: Saturday, March 19, 2011. Written on: Friday, March 18, 2011. Written on: Thursday, March 10, 2011. Written on: Tuesday, March 08, 2011. Written on: Thursday, March 03, 2011. Written on: Tuesday, February 15, 2011. Written on: Thursday, February 03, 2011. Written on: Sunday, January 09, 2011. Written on: Tuesday, December 07, 2010. Written on: Tuesday, November 09, 2010. How Do I Increase Bowling Ball Speed And Improve Accuracy? Written on: Monday, November 01, 2010. Written on: Monday, September 27, 2010. Written on: Tuesday, September 14, 2010. New Team USA Experience Leagues Debuting This Fall! Written on: Wednesday, July 28, 2010. Written on: Thursday, February 04, 2010. Written on: Tuesday, February 02, 2010. Written on: Monday, December 14, 2009. Written on: Tuesday, September 08, 2009. Written on: Sunday, July 05, 2009. Written on: Tuesday, February 10, 2009. Written on: Thursday, November 06, 2008. Written on: Thursday, July 03, 2008. Written on: Wednesday, May 28, 2008. PBA Patterns vs. League Conditions: What’s the Difference? Written on: Friday, May 23, 2008. Written on: Thursday, May 22, 2008. Written on: Tuesday, April 01, 2008. Written on: Monday, March 24, 2008. Written on: Sunday, February 03, 2008. Written on: Sunday, August 12, 2007. Written on: Monday, June 05, 2006. Written on: Sunday, April 09, 2006. Written on: Tuesday, June 18, 2002.